And... I am still waiting for my turn with this book at the library! I like the way you broke down the reasons it worked for you! One book that deserves all its hype is definitely All The Light You Cannot See! I agree completely. I asked (and received) a copy of All the Light We Cannot See for Christmas. It's such a beautiful book! What a great post! I couldn't agree more. Thanks Irene! I'm glad you enjoyed it too. Yes, yes, yes! I loved this one so hard! Just so, so good. Have you read any of her other books? It's fun to see so many people reading and loving this book over the past few months! I still haven't gotten to this one, but all the reviews I've read agree with you about it living up to the hype. Definitely one I need to read! I somehow didn't see this post until now -- it's showing up as having posted "0 minutes ago" in my blog roll. Oh, I so agree with everything you say here. THis book was brilliantly paced and well written, two things that don't always, or even often, go hand in hand. Right? There is something that strikes you every so often as you read and you think "yes, this." 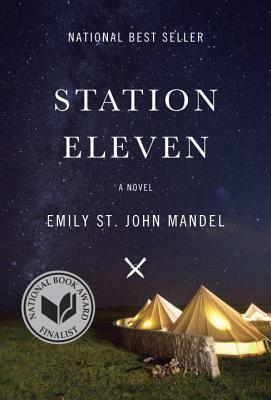 It's hard to define, but it's definitely present on every page of Station Eleven.